Then it was time to kick off! This is me now. An amazing likeness, don’t you agree? I’m currently working at Sheffield Uni, teaching on a General English evening course as well as delivering a workshop for my colleagues every so often. Alongside this, I am working on some materials with Onestopenglish/Macmillan, will be doing a couple of workshops for the M.A. in ELT multimedia and independent learning module at Leeds Beckett uni. Finally, I have got a book chapter coming out in a forthcoming IATEFL LT SIG book and recently had an article published in a peer review journal for the first time. At this point, it was the attendees’ turn to tell me about where they are now, and I can tell you, it was a real eye-opener! Such a diverse crowd all doing really exciting things! And this continued throughout the session as at each development point on MY map, I asked them to share theirs. I think I overused the word “awesome” in response, because their responses really were! Anyway, I suppose you could say I am “Freelance”, ish. I suppose it all sounds pretty cool. *But*, I am just a normal human bean. Mmm beans. So how did I reach this point? And what about this magic turning point? I collected feedback at the end of each term to find out what the students made of it all as a whole and it was positive by and large, making it all worthwhile. All this would feed into my book chapter for LT SIG. So was this my turning point? But wait…what about the materials stuff? And the journal article? So, what came before IHPA? So I was basically able to develop the skills that would enable me to pursue a variety of opportunities. But that isn’t all… for my dissertation project, I wrote some task-based learning materials (which I talked about at IATEFL the year before last – that long already!) which on a whim I submitted for the ELTon Macmillan new talent in writing award. Then I got shortlisted, which in itself amazed me. Then I won! Hence the earlier-mentioned materials writing…I am editing those materials to make them suitable for publication on Onestopenglish, and we are about half way there. Will miss it when it’s over! Why did I do that M.A. at that university? I went to IATEFL in 2012, my first ever IATEFL! Oh the excitement… And you know how you get a goody bag at the beginning? Who doesn’t love a good goody bag?! So, the first night back at the hotel room, I’m going through my goody bag and find a leaflet for this M.A. ELT/Delta at Leeds Met. So, 2012. Lizzie, at nearly 29 years old is feeling very old and under-qualified! I got into this ELT malarkey late, 26 and a bit years old. (Is/was it late? Lizzie thought so at the time…) Lizzie had to make up time…(hence the session title!) Lizzie had also just been rejected from a PGCE primary programme at Warwick University (thank the good Lord!) and was all “now what?” and so my guardian angel sent me the leaflet. After IATEFL finished, I applied, got accepted and the rest was, as they say… history! So THAT MUST HAVE BEEN THE TURNING POINT!!!! Again, absolutely yes. Except… ooops back up a bit… How did I come to attend IATEFL 2012? Cactus to conference scholarship! I remain indebted to them. But….how? Where was I? How did it happen? I worked in a couple of private language schools in Indonesia after graduating from my CELTA, as one does. I was feeling quite isolated so was on the internet a lot. I found a forum called I think Dave’s ESL forum or something (does anyone remember this? some of my attendees did and apparently it is still going!) and started a post on there. I can’t even remember about what, maybe about how to develop or something. Anyway, one of the respondents pointed me towards Twitter. And ELTchat. (Or did I find ELTchat after I found Twitter? I can’t really remember!) Anyway, the important thing is, I got on Twitter. Did ELTchats, summarized them (The dark beginnings of my blogging!) AND…one day…saw a link to IATEFL scholarships. Didn’t really know much about IATEFL other than it’s an ELT conference, but it seemed to be a big deal, so I applied for several and won the Cactus one, much to my amazement. So was THAT the turning point? Getting on Twitter? Again, there is a valid argument for it! But… why was I bothering with looking for ways to develop, in my isolation? I could done other things than looking for ELT forums etc!! The beginning of everything… But in particular the professional development session towards the end of the course, where we were made aware that you could make a career out of ELT and shown some possibilities, through our tutors’ stories and suggestions of what we could do to develop in future. (For example, that there exists this thing called the Delta that you can do after you have some more experience!) Honestly, I don’t actually remember many of the details of that session, but the important thing is it awakened in me a desire to develop and make a career out of ELT, it gave me that sense of possibility. And perhaps the awakening of that desire and sense of possibility was the biggest turning point of all? Most of the attendees mentioned that discovering the online teaching world as key in their development. Of course, for me, if I hadn’t discovered Twitter, I wouldn’t have seen the Tweet advertising IATEFL scholarships, so wouldn’t have made it to Glasgow 2012, wouldn’t have found that leaflet…etc! Because they are Good Things. And if I hadn’t…well you know the story already! Be warned: they are addictive! If I had acted according to my confidence in my ability to succeed, then a lot of what I have done I wouldn’t have dared to embark on in the first place! (I never in a million years thought I would win an ELTon, for example!) We (attendees and I) agreed that people often fail because they don’t try in the first place. And often that not trying in the first place stems from thinking “I’m not good enough, that’s for people who are better than I am”. But if there is one thing I have learnt, it’s that you only get “good enough” by jumping in in the first place. What you learn needs to be part and parcel of your professional life, weaving it’s way through, not something separate, on the side. For example, if I hadn’t tried to put the theories that struck me on the M.A. into action, my projects wouldn’t have happened and thus neither would my LT SIG book chapter. Not only that, but learner autonomy/metacognition/motivation etc wouldn’t have become part of my teaching, which would have been a shame from the students’ point of view! Thanks to the TD Sig for this opportunity and to all the attendees for making it such a fun, interactive session to deliver. This entry was posted in Conferences, Leeds Met Delta / M.A. 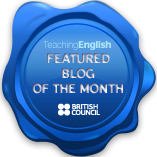 ELT, Professional Development, Reflections on teaching and learning and tagged Leeds Met Delta / M.A. 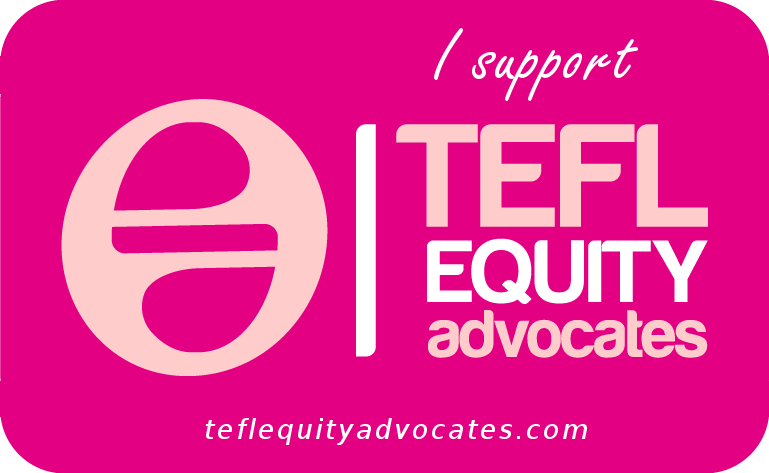 ELT, professional development, TD SIG web carnival, University of Sheffield, webinar. Bookmark the permalink. I really enjoyed the backwards unravelling from your session, Lizzie. Thanks for starting us off on a great foot! 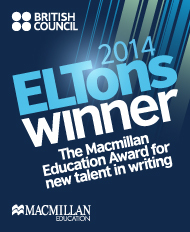 British Council ELTon winner for "Compass (Upper Intermediate)"